The world of Tukay’s poetry gave birth to numerous works of art created in different genres and styles. The images of Tukay have come to us in few survived photographs: thoughtful and sad look, handsome and chiselled face. Here he is among his friends, and here he is surrounded by members of «Saiyar» theatre troupe; here are his last days: Tukay in the hospital… the last days. These snapshots were used later to create portraits of the poet. The portrait of little Tukay made by H. M. Kazakov in 1948 is one of the first such works. A little boy sitting on a homespun Tatar carpet, sake, and looking at the outer world with bright eyes always produces in onlookers a feeling of tenderness and sadness. Portraits of Tukay by K. Yakupov, L. Fattakhov, Y. Simbirin, and I. Khalioullov were made at the same period. They stress the simplicity and national character of the poet. Created in traditions of academic realistic school, these works reflect time and become a document of the epoch. The 1950s and 1960s in life of the country were the period of postwar creation and heroisation of images in art. The most important for artists was his civic consciousness. This aspect in reflecting the Tukay’s poetry provided the ground for different plotlines and stories in revealing the image of the poet. The portrait by Simbirin distinguishes itself from these works. The author managed to create a deep and profound image, which is adequate to the poet’s strength of mind. The austerity of colour and laconic composition enhance the effect of its significance. The sharpness and clarity of the drawing, the resilient and vigorous modelling of spaces and colour contrasts produce a character that sticks into your memory. H. Yakupov created a triptych, in which one can hear a different, lyric tune that is in harmony with the autumn landscape. The 1950s were the years when sculpture flourished in the republic. The sculptural portrait of Tukay made in marble by B. Urmanche in 1959 has become insurmountable. It is a bright and, at the same time, tragic image. The austere and laconic modelling of volumes, classically delicate and complete, produces an image of a creator. 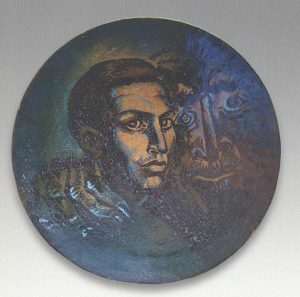 The portrait gallery of the poet also includes sculptural images created by R. Nigmatoullina, V. Malikov, N. Adylov, and A. Abdrashitov. Tukay created by V. Malikov represents a thinker and a publicist. The artist achieves his goal with the help of large modelling, harmony and integrity of forms, sculpturesque clarity and monumental sound. Childhood of Tukay has become one of the main themes in the art of R. Nigmatoullina. She carefully, in a motherly manner, personifies the orphan’s childhood and loneliness of a little boy, and reveals it in many of her expressive works, like «Little Apush», «Parting with Mother» and «Mother Tongue». The image of the poet was also reproduced in monumental form: in monuments to Gabdoullah Tukay in Kazan: on the Tukay Square (sculptors: S. Akhun and L. Kerbel, 1958); near the Opera and Ballet Theatre named after Musa Jalil (sculptor: E. Shulik, 1956); and in other cities of Tatarstan: Almetyevsk, Bugulma, Leninogorsk, and Nizhnekamsk. By mid-1970s, the Tatar visual art showed the tendency towards symbolic generalisation, decorativeness, and philosophic metaphor. A. Abzgildin, in his works «Tukay and Shurale», «Masterminds», and «Dream of Tukay» shows himself as an improvisator of a multi-layered treatment of plots and images. In his other large composition the author remains faithful to his philosophic, generalising and symbolic style in painting: his work titled «Dedication to Poets» takes us back to roots in the images of Kul Gali and the «sad Derdmend», the contemporary of the poet. S. Shaidoullin reflected all stages of Tukay’s ascension to the poetic Olympus in his triptych «People’s Poet» showing loneliness, bright publicism and tragedy. Using the expression of shape and colour, and the contrast of coloration, the artist shows the rebelliousness and divinity of the poet’s spirit. The original art of I. Zaripov is permeated by the national theme. In its context he creates generalised works reflecting the atmosphere of Tukay’s words. The image of poet created by M. Khayertdinov lives in a refined and lofty spirituality. His painting is full of glowing colours, ornamentality, and the image is filled with elegance and dreamy irreality. V. Fedorov shows Tukay surrounded by actors of a theatre troupe. Tukay welcomed the birth of theatre, and admired the courage and talent of the first actresses. European, fascinating, they were people of a different mentality, who overstepped the yoke of convention and civil bans. Their art sounded in unison with lyric poetry and publicistic works of Tukay and Amirkhan, and grotesque satiric drawings of Kamal. Fedorov masterfully creates characters that are refracted through the prism of Tukay’s style, and reflect his time. Tukay’s poetry was created over a century ago, but his works are still modern and his thoughts are consonant with the present day. Modern artists revert to unfading images again and again. The realistic line in modern painting is traced in works of the older generation of artists, such as U. Abdullov, K. Nafikov, R. Vakhitov, I. Rafikov; and some representatives of the younger generation, for example, F. Yakupov and Z. Gimayev who show not only the poet himself, but also the time and spiritual base of Tukay’s phenomenon. In modern painting, the poet’s image is interpreted by R. Kildibekov, I. Khasanov, A. Ilyasova, and R. Salyakhov by what could be called a conventionally plane language. Expression grows in dynamic paintings by R. Karimoullin. The refined works by M. Khaziev and Z. Minnakhmetov are filled with fantasies and associations, just like the abstract compositions by V. Timofeyev and V. Skobeyev. In the graphic woks of M. Kuznetsov-Kazansky the white background organises the space of the composition by a dynamic line. The poetic style of Tukay formed the basis of the calligraphic image, the image of the Word. His poetry is philosophically deep, comprehensive and edifying. That is why some of his lines have been transferred from secular interpretation into the Divine. As early as from the beginning of the 20th century the Tukay’s verses were used in the texts of shamails along with suras of the Koran. But they got a truly delicate and beautiful framing in works by B. Urmanche. The liberty of compositional organisation, Oriental elegance and monochromy, the laconism of the artistic language were intrinsic to Urmanche. On the contrary, the calligraphic works by N. Nakkash are bright, saturated, and full of open colours. Nakkash created tugras of Tukay with his name. They are graphically neat, noble in their sounding and add a new shade to the poet’s image. The poet’s image is concordant with landscape painting. The Tukay’s places were the source of inspiration and creation of a large number of lyric and epic landscapes. S. Lyvin glorified the poet in his series titled «You are in My Mind and Heart, My Homeland», in which he showed picturesque corners of nature as a lyric artist. «I often lied on grass and looked at skies. The endless forests looked like a formidable host. Rich is the graphic collection of graphic works connected with the name of Tukay. They include the aquarelles by R. Gusmanov, and G. Rakhmankoullova, etches by M. Mavrovskaya, and drawings by T. Zuyeva. There is a special spirit in them, which is consonant with the distinctiveness of Tukay’s poetry; they reflect the atmosphere of folk poetry, full of never-fading life and creative spirit, from which the poet drew the spiritual force and motifs for inspiration. Among the landscape works dedicated to places described in the Tukay’s poetry, noteworthy are the compositions by R. Yamanova, whose art is permeated by the theme of the Tatar village: its way of living, quiet lonely small streets, as if asleep and exhausted by summer heat. They are organically supplemented by miniatures of R. Zagidoullin, who created a series titled «Memories of Kyrlay». In it, the artist shows with great warmth the patriarchal character of village, its cares and holidays, hay-making, slow chats of old women, anticipation of Sabantui, summer heat… In all this, there is a special mood of Tukay’s lyric poetry dedicated to his homeland.